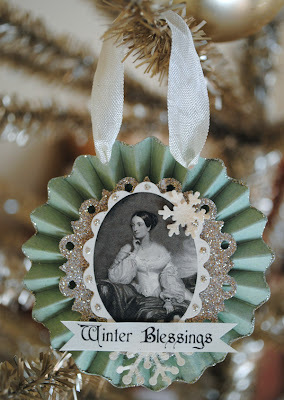 Artful Affirmations: Deck The Halls Sunday! This is really really cool. I love your idea. I am debating rather to decorate or not. Will make up my mind in a week or so. Love that you will be using her homes too. Hmmmmm, are you trying to inspire me to decorate? Larcy already started hers today. Hugs, girlfriend! Your tree and decorations are looking lovely! Your tree looks great. I love the ornaments! What could be better than Jane Austen? ...Hrmmmm Mr. Darcy!!!! Like Marlynn, I haven't made up my mind about decorating either. I'll be gone for awhile and by the time I get back, it will only be a week till Christmas. SO, it seems you are the decorator of the month around here! I love your ornaments and the new one with the netting is so pretty. The color is a nice contrast to the blue ones! For a 'chuck brown tree', it's looking more like French Pastry!!! What a lovely little tree. I love it! Terri, your ornaments are just beautiful! This is my favorite time of year Terri!!! 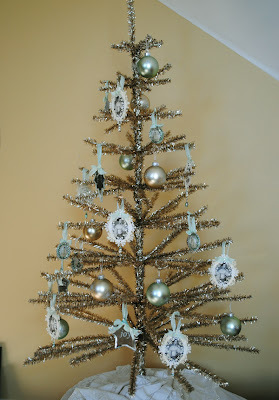 this is so gorgeous....love the ornaments on that vintage tree!!!! 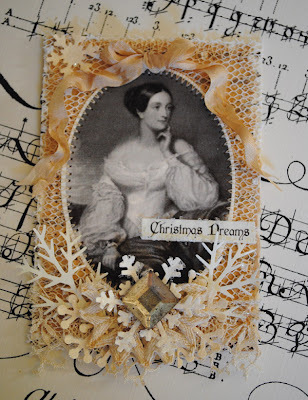 Oh this is lovely - how marvellous that you carve out time to make decoartions to a theme...and they are sooo lovely. Beautiful colours. Terri, you continually impress me! What a neat idea for a tree! 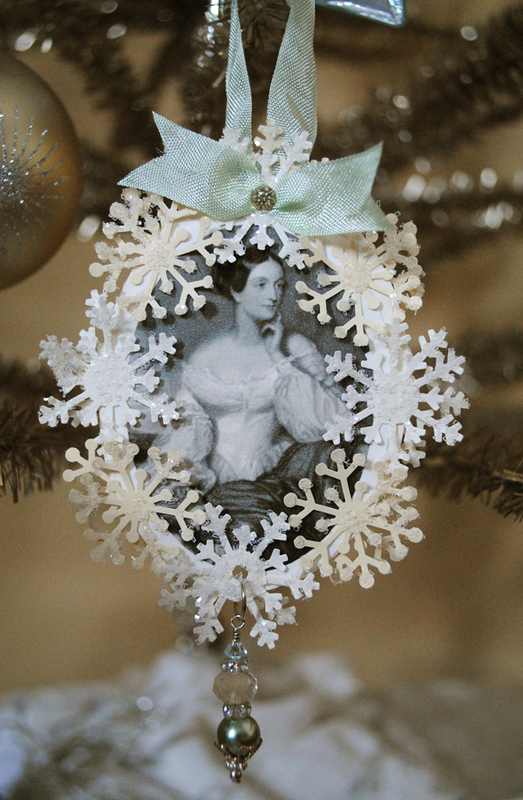 Your ornaments are simply lovely and suit both the holidays and the spirit of Jane Austen. I LOVE these thanks so much for sharing. I just love making things for christmas. The holidays are so inspiring. My tree is decorated with a mix of earthy and victorian style. Dear terri, they are so beautiful. I love you used the aqua-and silver, and the image of Jane is truly lovely.Your ornaments are fantastic. It's beautiful -- love that soft green color you're using! Hi there...I am having fun....but I will guarantee ...... I am NOT as creative as YOU are. Just lovely. Terri, I love checking in and finding out how your tree is coming along! Love your latest ornaments! I used another one of my bleached wreaths on my ornie today - I am addicted, lol! You always have such beautiful creations and you are always an inspiration! These ornaments are BEAUTIFUL !!! your tree is breathtaking Terri! I also love the images and colors you are using for the ornaments! Just a few more hours and I get to meet you! pinch pinch! The Jane Austen theme is lovely. Your ornaments are just wonderful as usual. If I get to make anything I'll link up. In the meantime, in between working, I'll enjoy what others are currently doing. Your theme is intriguing and your ornaments stunning! The tree is just beautiful! Very vintage looking! I love them all. I love your style!! The Charlie Brown tree is perfect! Jane would be proud of your tree! your Christmas Ornaments are amazing. I love the one with the snowflakes. Such a cute work. Thank you for sharing your clever ideas. Terri, these ornaments are so, so pretty! I can't wait to see your tree evolve.